I made this kootu on last week friday. I got the recipe from Rashmi's blog. I just followed the same. Soak garbanzo beans over night. Pressure cook garbanzo beans with a pinch of salt and keep it aside. Now take a pan, pre heat a drop of butter, add tomato, onion, garlic, green chillies, ginger, cloves, cardamom, bayleaf and stir it for 2 mts. Let it cool and grind it into a fine paste. Now pre heat remaining butter, splutter cumin seeds and add the grounded paste, add turmeric powder, red chillies powder and let it cook for 3 to 5 mts. Add some water if necessary. 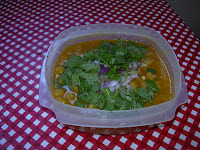 Now add the cooked garbanzo beans and cook it for another 5 mts. let everything mix together. Garnish it with fresh coriander leaves. Serve it hot with chapathis. This is the first time I am trying this dish. 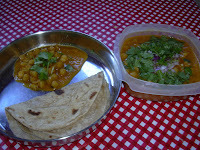 I gave this as dinner along with hot chapathis to my girls' teacher who has never tried Indian food before. Thank god! she liked it. 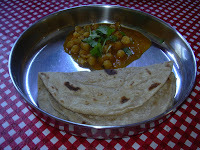 i love channa masala .. onr of the most comforting side dishes ..
Yep Swati, She should be happy. Hope she get time to look in to it:) With her hands full I don't think she is sitting near the computer now a days. thanks Shama and deesha, even I like it.